We think that Aviles is the best of the three major cities in Asturias - at least from a tourist and sightseeing perspective. In some ways Aviles lacks the grandeur of Oviedo's larger and more regal civic buildings and if you look for negatives, then a cathedral is also absent. But those are the only areas where Aviles really misses out. The old town is extensive and unusually light and colourful with many of the old town houses painted in every hue of red, yellow, pink, green and blue. It may sound tacky, but it is not and it adds to the uniqueness of this pretty old town. Aviles is a city where its total is greater than the sum of all its parts and it should be viewed as a complete package, rather than as a list of individual buildings and monuments. 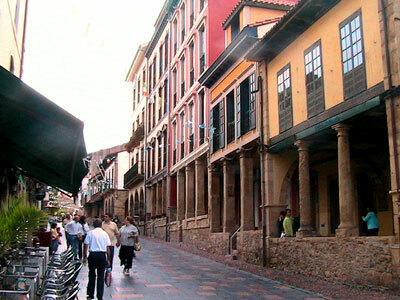 As a tourist, if you do not look at Aviles in this way, you may choose not to visit it and that would be a mistake. 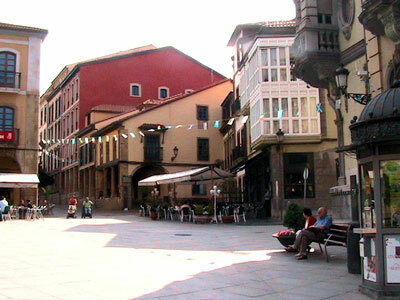 The high points of Aviles are the distinctive pastel shades in which many of its old building are painted and the various plazas and small parks that interlink within the old quarter. The main town square, la plaza de Espana, sums up Aviles perfectly by being understated, but atmospheric and as you walk through Aviles you like it more and more. Aviles definitely has its fair share of history along with an old district where the street layouts and arrangement of municipal areas have remained unchanged for centuries. It also has buildings dating back to the twelfth century and the newer sections of the city are all within easy walking distance of the old. One small negative about Aviles is the cost of eating and drinking. This is definitely at the top end of what you expect to be charged in northern Spain, but even then it is still below the prices found in the UK and on a par with those of the USA. We also experienced a lack of non Spanish language guides and booklets at the tourist office, but this was because they had run out rather than omitted to produce them. In summing up, we would say that if you are on route to the Picos de Europa and the area around Cavadonga and have just one city stop to make, Aviles should probably be it. Opinions are always subjective and personal, but we preferred Aviles to both of Asturias' other cities of Oviedo and Gijon and we would probably also add that the photos of Aviles do not really do the town justice.